5 Reel, 25 Payline video Slot with a Free Spins Bonus, Wilds and a Bonus game. Admiral, Pilot, Helicopter, Medic, Fighter Jet, Carrier, Destroyers, Frigates, Submarines and the regular 9 to Ace symbols. 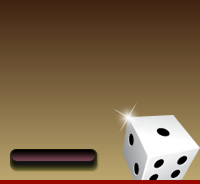 Maximum wager of 125.00 and a Minimum of 1.00 per spin when playing all 25 lines. The Wild substitutes for all other symbols to help complete winning combinations. There are also stacked Wilds that reward a 2x multiplier to all winning combinations formed. This symbol replaces all of the symbols on the reels besides the Bonus and Free Spins symbols. These can be found on any or all of the reels in any single spin allowing for a larger win! The Free Spins will be activated when landing on the Bonus symbol. A new screen will open with the choice between ‘Sink the Fleet’ or ‘Winning Encounter’. Win up to 100 Free Spins! Every time you get a hit on an enemy ship the multiplier increases by 1 up to a maximum of 5. 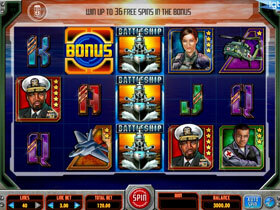 The feature ends when the Battleship is sunk or 100 free spins are completed. Win up to 36 Free Spins and a 10x Multiplier. This Bonus is triggered when 3 or more Bonus symbols appear across the reels. 5 Warships will appear, pick which Warships to blow up using the missiles awarded to you. When the Warships explode they will reveal prizes with up to 36 Free Spins and a 10x Multiplier. 3 of more Bonus symbols on an active payline will activate the bonus round, choose one of the 2 bonus rounds to play.